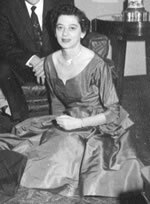 Anna Greenberg, sister of the late Bertha G. Louik (A&S ’42, MLS ’69), established the Bertha G. Louik Endowed Scholarship, through a $100,000 bequest, to benefit library science students. Ms. Greenberg decided to establish a scholarship in her sister’s name because Mrs. Louik attended the University of Pittsburgh on a scholarship. While in high school, Mrs. Louik won first place in an essay contest, whose prize was a scholarship. Mrs. Louik decide to attend the University of Pittsburgh, where she received a degree from the School of Arts & Sciences in 1942. Immediately following graduation, Mrs. Louik married and moved to Washington D.C., where she worked at the Agriculture Department. Several years later, she and her husband returned to Pittsburgh and adopted a son, Chris. Mrs. Louik worked at the Post-Gazette and as a substitute teacher. At the urging of Ms. Greenberg, Mrs. Louik returned to school for her library science degree, at the School of Information Sciences. In 1969, upon completion of her degree, Mrs. Louik worked at the Chatham Library. When the Chatham Library reduced its staff, Mrs. Louik went to the Carnegie Library as a Reference Librarian. She went on to work at the Carnegie Library for over 20 years, until she retired. Mrs. Louik enjoyed tending her garden, collecting miniature vases, and writing. Her sister, Ms. Greenberg, described her as smart, talented, and inquisitive. "She was incredible at what she did," Ed Cohen gushed when talking about his late wife, Sarah Cohen (MLIS'95). "The MLIS degree gave her professional life a purpose." Sarah Cohen did not plan a career as a high school librarian. She received her Bachelor of Arts degree in pottery from Indiana University. After deciding against an art career, Sarah pursued her paralegal certification from Georgetown University in Washington, D.C. After relocating to Pittsburgh and accepting a job as a paralegal at a local law firm, Sarah realized her true passion. She told her husband that she always wanted to be a librarian. Receiving her Master of Library and Information Science degree in 1995 from the University of Pittsburgh School of Information Sciences, Sarah accepted a position at Northland Public Library in Ross Township. She soon realized that the community library environment was missing something – students. Sara enrolled in the University of Pittsburgh School of Information Sciences School Library Certification Program(SLCP) to receive her Instructional I teaching certificate in Library Science, K-12. The couple relocated to Maryland where Sarah completed her student teaching and was hired by the Fredrick County Public School System. In 2002, Sarah accepted a position as the school librarian at Poolesville High School in Rockville. Finally in a profession she loved, Sarah's enthusiasm and dedication transformed the Poolesville High School library program with new initiatives, grant funding, and transformative curriculum that included television production. Sadly, Sarah suddenly passed away in 2006. Ed Cohen knew the only way to honor his late wife was to create a scholarship at the school that fueled her life's passion. He established the Sarah C. Cohen Endowment for the School Library Practicum Experience. The fund is used by the Library and Information Science Program to provide awards to outstanding students in the SLCP. Awards may be granted to students completing the Practicum in both the Fall and Spring term. "We were fortunate that Pitt was there to prepare Sarah for a career as a high school librarian," says Ed Cohen. "Through Sarah's legacy, it is wonderful to know my gift helps others pursue a profession close to her heart." Jennifer (A&S ’88) and Eric (SIS ’88) Spiegel understand the strain the rising cost of textbooks can have on a student’s finances. As a way to help lessen that burden, the Spiegel’s have established the Jennifer and Eric Spiegel Book Endowment Fund for undergraduate students in the fields of Communication and Information Sciences. There are two annual awards: one for a full-time undergraduate student in the Information Science program and the other for a full-time undergraduate major in the Communication department. Jennifer and Eric recognize the importance of a higher education because Eric’s father was deported to concentration camps during the Holocaust and was never able to finish high school. Growing up, his father made education a high priority for Eric and his siblings. Eric hopes to honor his commitment to education by supporting other students in need of financial assistance through the book endowment. He knows how helpful book scholarships can be since his fraternity, Delta Tau Delta, awarded him one his senior year. To qualify for the award, students must submit an essay on the topics of technology or communication. The Spiegels say their number one priority for the essay is creativity. Students that exemplify originality and genuine enthusiasm for the topic are typically the ones that receive the awards. “The ones that stick with us are the ones that use wit and humor to drive their point home. We have found that a technical topic may not always hold the readers interest, but if the author infuses an innovative approach or new way to look at the topic, the result can be a rapt audience who will remember what they are reading,” said Eric Spiegel. The Spiegels reside in Maryland, but once claimed Pittsburgh as their hometown: Jennifer is originally from Mt. Lebanon and Eric, McKeesport. The iSchool is dedicated to the building of a global society and an informed citizenry based upon access to reliable and useful information.